Que. – What is iris? Write its function. Ans. – The colour part of eye is known as iris . it gives blue black & brown coulor to the eyes. It has a hole in the middle named pupil which regulates the amount of light entering in to the eye. Que. – Write the function of cornea. Ans. – It refracts most of the light rays into the eye. Que. – Write the name of light sensitive part of the human eye. Que. – Write the function of optic nerve. Ans. – Its function is to carry electrical signals to the brain. Que. – Name the eye muscles which have ability to change the focal length and curvature of lens. Que – What do you understand by power of accommodation? Ans. – The ability of the eye lens to adjust its focal length is called power of accommodation. Que. - The wavelength of which colour is the longest. Que. - Write the name of light sensitive part of eye. Que. - What is called the band of the colored components of a light beam? Que. - Write two phenomenons caused by scattering of light. (I) looking sky blackish to an astronaut. (ii) looking the sun reddish during the sun rising and setting. Que. - What do you mean by power of accommodation? What happens, The eye loses its power of accommodation? Ans. - The ability of the eye lens to adjust its focal length is called power of accommodation. When the eye loses its power of accommodation, the eye does not be able to adjust it focal length resulting in not to see the objects of various focal length. Que. – What do you understand by scattering of light. Name two phenomena caused by scattering of light. Ans. - The Earth’s atmosphere has many types of colloidal particles, which makes the path of a beam of light visible. Such a phenomenon is known as scattering of light. Two phenomenons are as follow. Que: – Why does sky look dark to an astronaut? Ans. – The space does not have air or other particles, there is no atmosphere like the earth. There is only vacuum. These particles are responsible for scattering of light . So there scattering of light does not take place and sky looks dark. Que. - Why do the small particles of air scatter blue colour more speedily than red colour? Ans. – The small particles of air scatters more effectively blue colour and red colour. As these particles are more effective scattering light of shorter wavelength of blue colour than longer wavelength of red colour. Que. – What is presbyopia ? give region for this defect? How does it remove? Ans. – When the eyes have lost completely their power of accommodation. The near point gradually recedes away. The persons find it difficult to see near by objects comfortably and distinctly without corrective eye-glasses. This defect is called presbyopia. Que. - A person can’t read a news paper clearly but he can see comfortably the newspaper placed at distance of 80 cm. (i) By which defect of vision does this person suffer? Ans. – He suffers with hypermetropia. 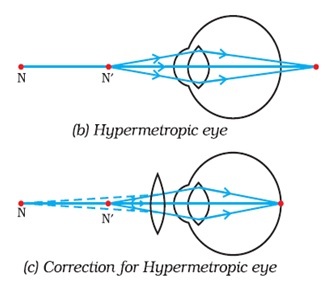 (ii) What is correction of this defect of vision? Ans – By using convex lens of appropriate power. (iii) Give two regions for this defect of vision? (a) the focal length of the eye lens is too long. (iv) Show to draw the light ray graph of this defect of vision, How is this corrected?